Put Your Name on WHBPAC! As a regional, cultural focal point, we attract a very affluent audience…many of whom live on the East End, either full time or on weekends, as second homeowners. They are mostly professional, owner or management, all of which is consistent with their interest in the Performing Arts. The Center is the only year-round performing arts facility in a region where people spend more on their homes, automobiles, clothing & jewelry, dining out, financial services, hobbies, entertaining, travel, as well as the arts. 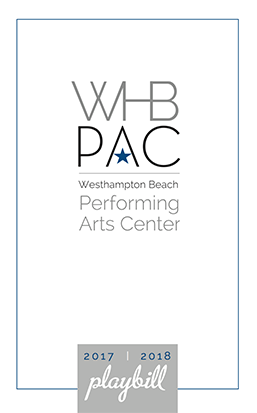 Our audience drives year-round to the WHBPAC from Greenpoint, Syosset, Montauk, and all points in-between. Please help us keep our doors open and curtain up! For more information, please contact Roberta Shoten at 631-288-2350 ext. 117. Be the first to know about upcoming shows and exclusive offers.